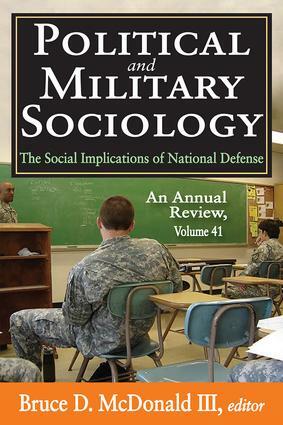 Political and Military Sociology, Volume 41 explores the social elements and impact of national defense. The origin of government is a response to a society's common interest in security and defense. In recent years, security and defense issues, and government responses, have become increasingly prominent in societies around the world. Despite intermittent pushes for privatization, however, security and defense have remained core functions of government. In this volume Bruce D. McDonald III investigates the historiography of the defense-growth relationship. Lachezar G. Anguelov and Robert J. Eger III consider the social impact with a case study of the Republic of Serbia. Maximiliano Mendieta and Bruce D. McDonald III consider the social spillovers of the sector that arise after the completion of a soldier's service. Paul Kellogg considers why some countries have fared well when others have been slow to rebound. Hamid E. Ali studies pork barrel spending in the United States. Susan Sample, Brandon Valeriano, and Choong-Nam Kang broaden the understanding of the defense sector to include its output. Hamid E. Ali and Ubah A. Adan conclude the volume with a study on conflict and infant and child mortality rates. Traditionally, national defense is viewed solely in military terms. As part of their national security objectives, many defense sectors have undertaken a variety of social programs. While the existence of social programs is known, what remains uncertain is how they spill over from the sector to society at-large and what is the impact of that spillover.